I did like Animal Crossing New Leaf. Unfortunatley, between half a year and a year ago, Katt moved out of my village and I haven't really played the game since. I want Katt back! This is beautiful! There are so many lovely details, and you really captured the joy and harmony of New Leaf. The first things that catch my eye on this are Leif (who looks adorable) and Pascal relaxing on the water. There's a real sense of togetherness in this, what with the three hedgehog sisters reunited in this game (and under the tree) and Reese and Cyrus snuggled up together under the tree. I just love this! Wonderful! The smiley AFTER the point. It's a smiley wink, a sign of appreciation. Sorry if you were upset. Do you prefer this smiley? 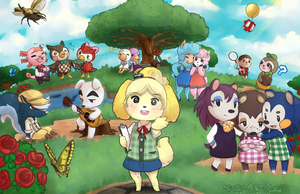 This picture you've done of these characters from "Animal Crossing: New Leaf" looks very nice and cute. SOOOO cutesie! This is adorable! This is beautiful, I love it soo much!! I'm glad you like it, but I have to say no. People's artwork is often their livelihood, copying isn't generally condoned. You should create your own pieces. Ah I understand ^-^ However I dont intend on copying, I dislike people who do that. I just love the placement of some of the characters in your pic. Great job on this! I love it! Wow! This is amazing! I really love it very much! Everything in the picture is... PERFECTED! This drawing is extremely beautiful! Awesome! Mind if I use this in a video? I'll give you full credit and a link in the description! Mew= extra cuteness points~ Every time. I am absolutley going to get this! Hey, sorry the text on this was out-dated. I'll have it for sale at Anime North and hopefully Otakuthon/FanExpo this year. If not you can buy a print here. Realistically I think I'd be slowly backing away out of the town. Town of nutters. Fair. But at least they're friendly! Best AC title I've played, been a major improvement over Wild World and City Folk!